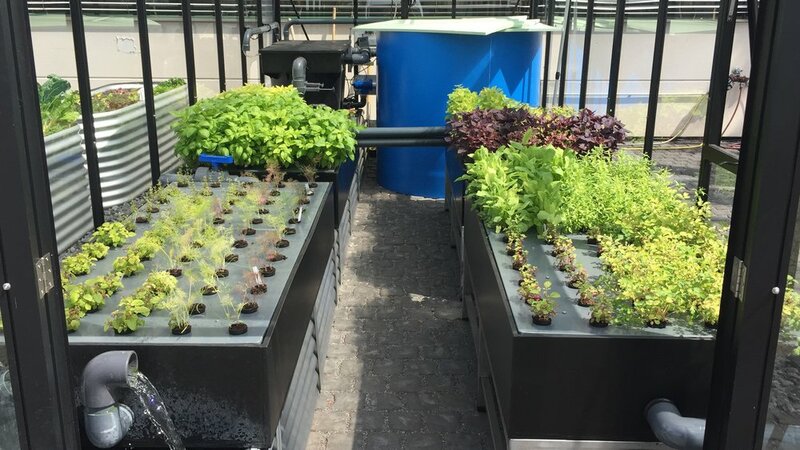 With our CityBotanicals systems, we provide every user an efficient option to cultivate a rich variety of delicious vegetables, salads and herbs in conjunction with the preservation of freshwater fish. For families, singles, home- or garden-communities with the desire of self-sufficiency. For fine dining restaurants or hotels or to complement their offer of fresh food or bar-botanicals. For kindergartens, schools and other educational institutions for environmental education. CityBotanicals cultivation systems guarantee high quality and taste of the products! Get back to independence and regain control of what you eat! Shortest distance between harvest and processing 'on site’, guarantee freshness of the products. It is a high efficient, sustainable production method with absence of any transport logistics, saving water, energy and other resources. Through their digestion and breathing, the fish release ammonium-containing substances into the water in the fish tank. These are then converted in the biofilter utilizing two bacterial strains into nitrate (= plant fertilizer). In 4 hydroponic tanks the nutrients are then absorbed through the plant roots. The 'purified' water can thus be returned to the fish tank. Enables harvest and preparation of fish and vegetables 'on-site' which guarantees high quality of freshness and taste. Saving water, low energy consumption and without toxic emissions into the environment through efficient circulating system. No use of pesticides, chemicals or antibiotics! Sustainable and ecological production of organic food on highest level. Best conditions and easy operation under optimal conditions! Packed in a high-quality glasshouse from the supplier Vitavia, our CityBotanicals system impresses with a linear use of uniform materials and a clearly structured inner space. The high-quality components such as fish tank and growbeds are made of food-grade PE plastic, which is also used in commercial breeding. It offers with our basic model the possibility to breed up to 45kg of fish per year and space for an individual collection of 200 plants for vegetable-, herbs- or salad- cultivation. You will achieve a remarkable degree of self-sufficiency for your family, your household or your garden-community . A round blue 1.400 liter fishtank as the nucleus of the system. It is following in material, function and shape the guidelines of a commercial aquaculture. A modified filterunit containing sedimentation and biological filtering. An UV-lamp to inactive microorganisms such as algae, bacteria or virus and an automatic fish feeder. All constructed for easy and efficient handling. The four Growbeds for around 200 plants are based on stainless steel tables with Rafts for 8cm and 5 cm Meshpots. The two sumptanks are splittable to disconnect hydro- and aquaculture if neccesary. The clean surface allow a dirt-free handling of plants. The black greenhouse of the brand Vitavia (type Poseidon 15700) consists of a solid, powder-coated aluminum profile with ESG safety glass on the side and hollow roof panels including four roof windows with automatic opening. It has the dimensions: 256 cm x 612 cm = approx. 15.70 m². Food with identity and taste! We will be delighted to advise you on your current project! We want to give everyone the opportunity to grow their own self-produced, high quality food. we can also fulfill for you! Through our conceptual consultation and support we find solutions for your individual needs! for self-sufficiency are suitable for singles, families, gardening communities or even commercial use. is to find the right production structure and plant assortment according to your needs and preferences. For commercial use of our systems, our consulting also includes distribution and marketing. You are planning a commercial hydroponic or aquaponic farm? Contact us! We can also help you with our competent and experienced partners for hydroponic or aquaponic farms. "How do we want to live?" Urban agriculture is currently not present on the agenda of the society or as a topic of the future. The development of cities, the planning of urban space is still focused on the development of infrastructures for mobility, communication and health. Driven by the basic question that is relevant to us: "How do we want to live? ", Our products and services offer opportunities for expanding the Urban Green Infrastructure in urban areas. For us, this is a key issue for the sustainable development of the urban environment, to which we pay close attention. Our products and services promote and implement sustainable supply strategies in urban areas. We focus on the development of innovative aquaponic systems for the production of fresh, healthy and tasty organic food for the private households and for commercial use. For us, it is also a matter of the heart to ensure that more awareness and knowledge about our diet arises. Education in this topic should begin in childhood! With the background of several studies and scientific findings, it is now important to give our children access to knowledge about food production and to restore food identity in general. We think it's important that kids can learn with fun what food is all about. From production to 'how to use' in cooking.